IGNOU Provides every year entrance exams for various courses. Now IGNOU conducts the entrance exams on 17.8.14 for B.Ed and M.Ed. This entrance exams were conducted on so many exam centers which were allotted by IGNOU. On the basis of the the candidates score card and merit list takes the candidates for admission. It also conducts the entrance exams for doctor of philosophy (Ph.D) in Civil Engineering, Computer science Engineering, Electrical Engineering and other courses also. Now the candidates who were written these B.Ed and M.Ed Entrance Examination were eager to know the Answer Keys. 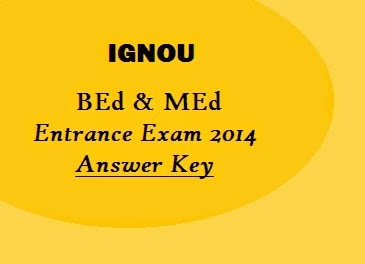 Our website will provide you the tentative answer key for these IGNOU BEd & MEd Entrance Exam 2014 Key Answer. Surely it will be useful to all of you. On the basis of the answer key you can calculate your marks and assume your success.